A delicious slushie will goes down a treat with your guests at your event all year round!!!! Our slush machine is a twin tank machine, which means that you can have two different flavours of ice cold slush served at once. Our most popular flavours, and supplied as standard, are 'Red Strawberry' and 'Blue Raspberry' although different flavours are available at request. 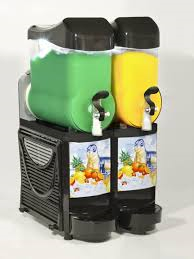 When hiring our slush machines you are supplied with everything you need for 100 servings of icy slush. Including 24 litres of slush in total, 12 litres of strawberry and 12 of blue raspberry, 100 cups to serve your slush in and also 100 straws too. So everything you will need, so you, your guests and your friends can just sit back, relax and chill with this amazing popular drink.